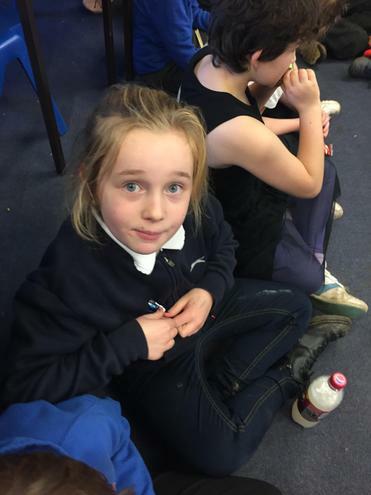 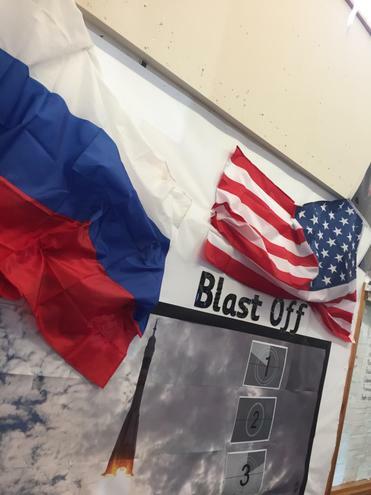 Here you can see all of the amazing things we are learning about in class! 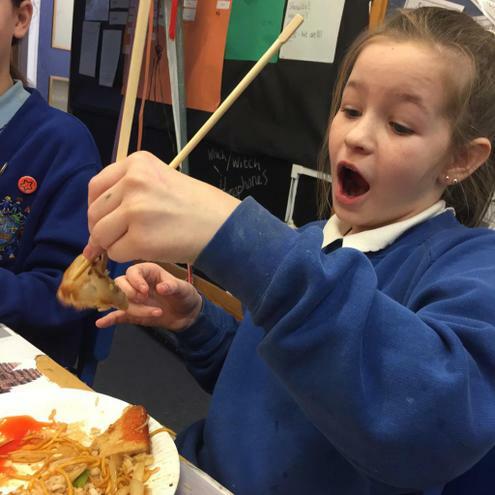 Remember to sign up to our DOJO page to keep up to date with everything we are doing! 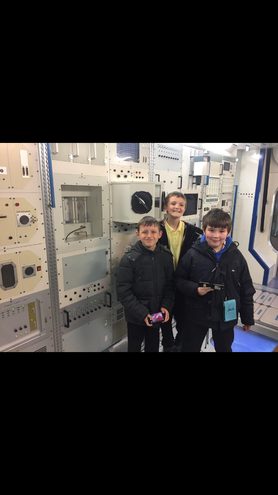 Our topic will work towards our final project which is a specially designed website all about Space including 'How to' YouTube videos! 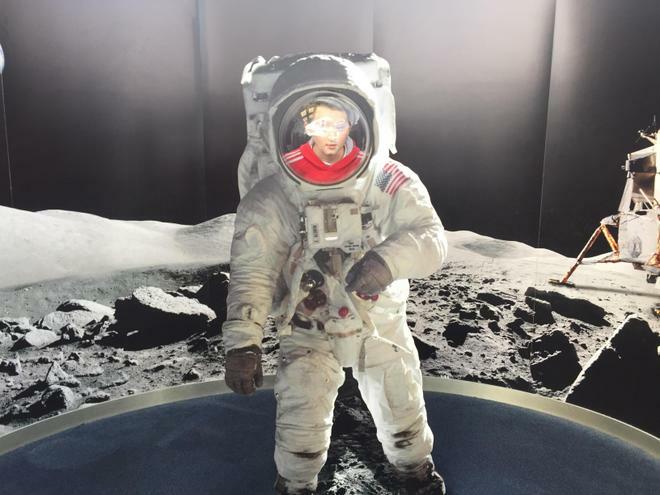 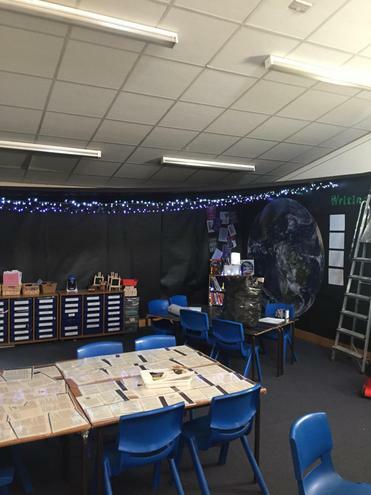 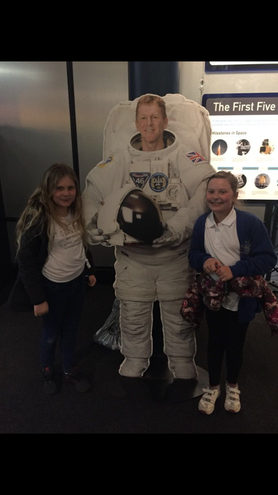 In literacy we will be creating Non-Chronological reports on the Solar System and its planets along with newspaper articles on famous journeys into space and explanation texts all about Day and Night! 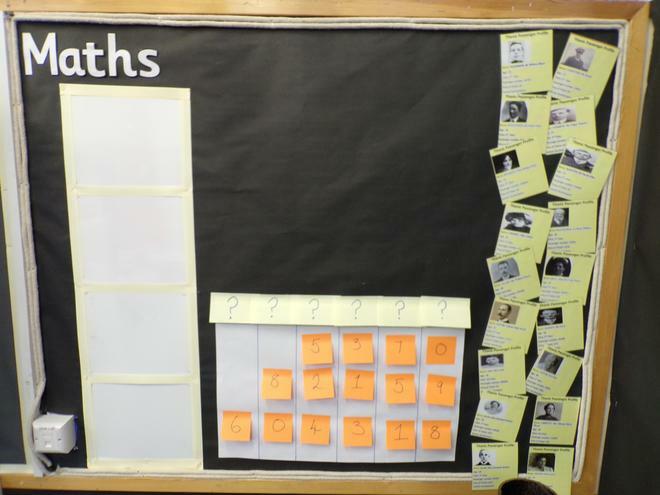 In maths we will be securing our calculation methods as well as focusing on developing our reasoning skills using various mathematical investigations and word problems! 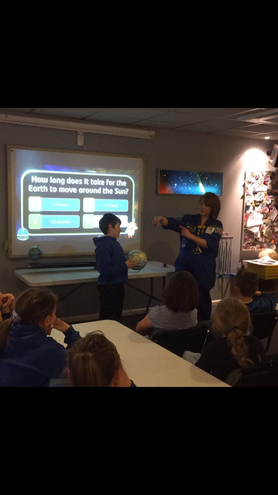 - Use the idea of the Earth’s rotation to explain day and night and the apparent movement of the sun across the sky. 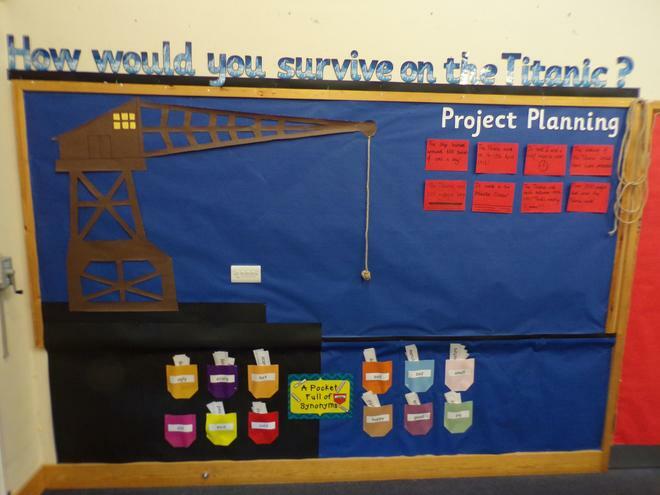 Project Timeline planning . 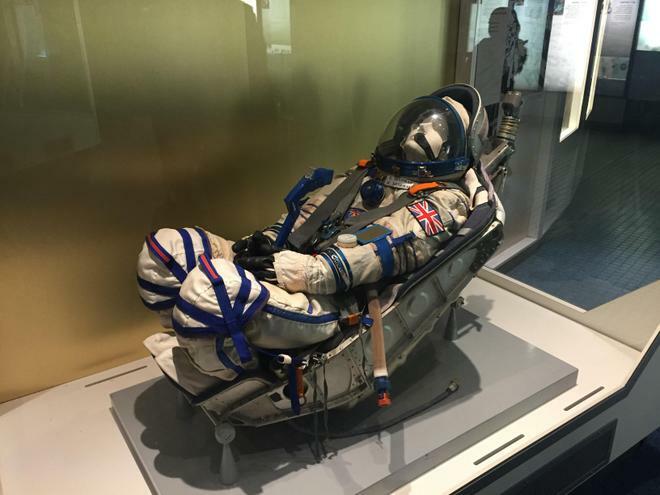 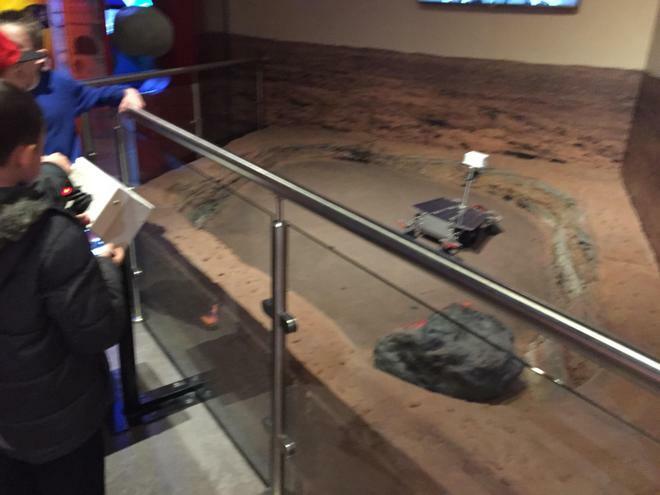 WHAT MAKES SPACE TICK? 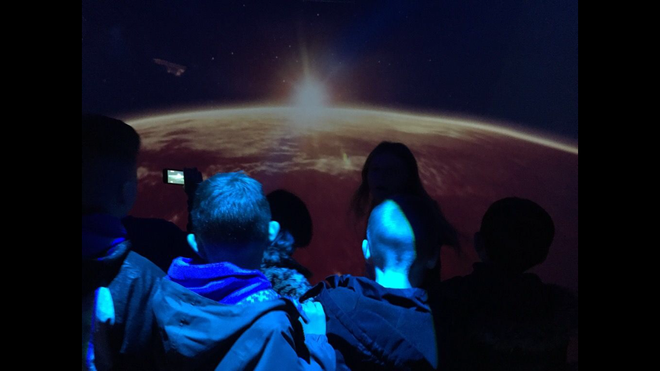 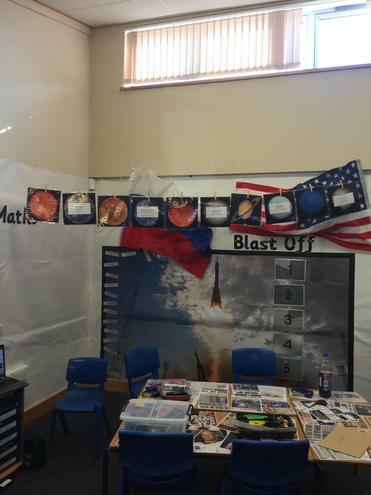 Check out some of our amazing science based learning! 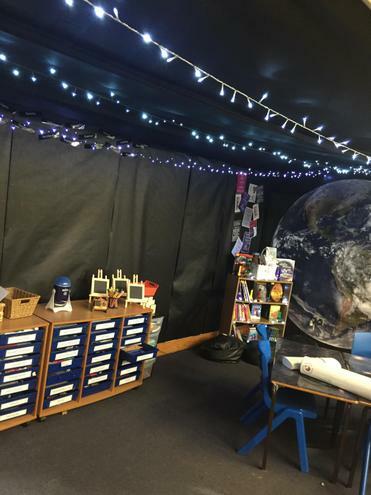 We planned 3D models of our Solar System before making them using polystyrene balls, dowels and paper mache! 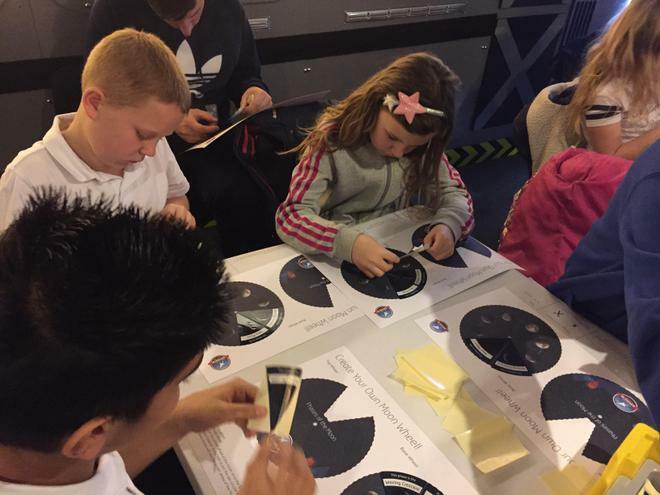 We even got to design and make out very own rockets and then test them out to see which ones went the furthest!!! 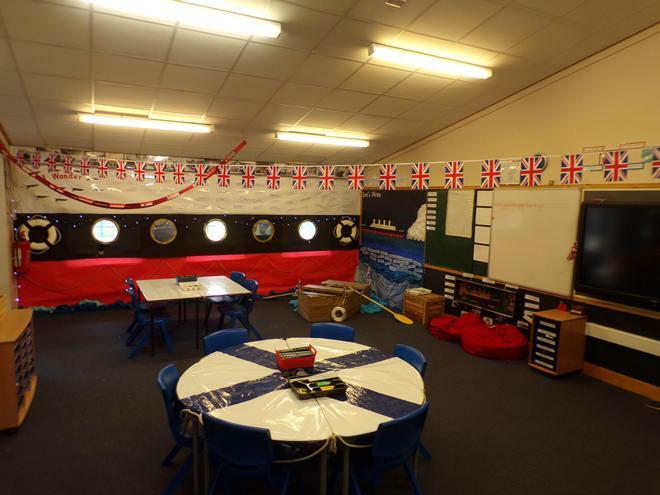 Check out our awesome classrooms!!!! 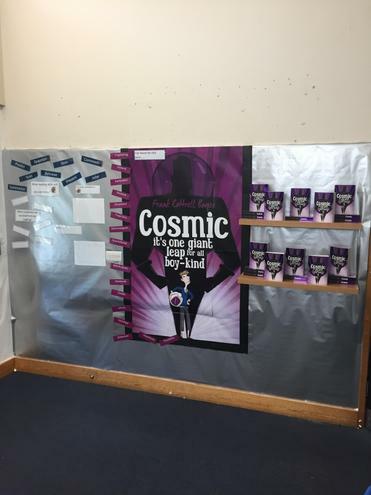 Our Novel Study for this term is Cosmic by Frank Cottrell Boyce. 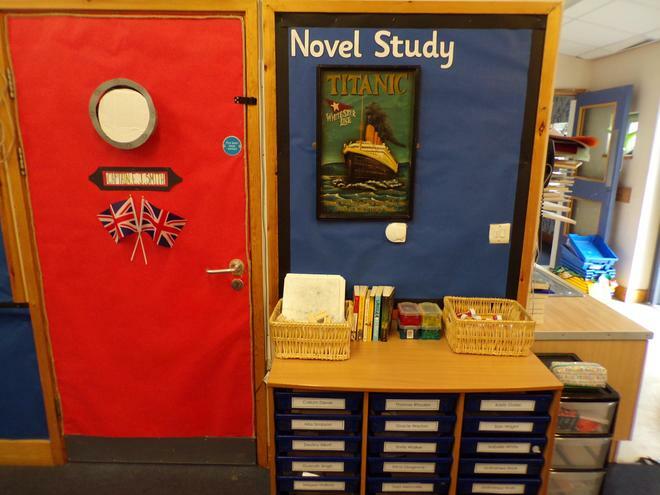 We will be using our Novel Study for lots of our reading lessons and focusing our learning around it too! 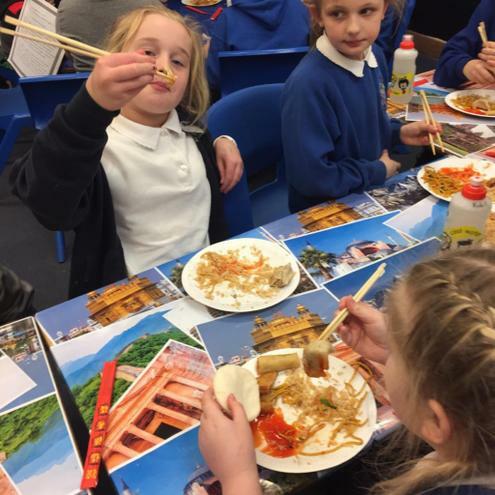 We will be looking into the beautiful continent of Asia and learning all about the Asian wonders from the Great Wall of China to the Taj Mahal. 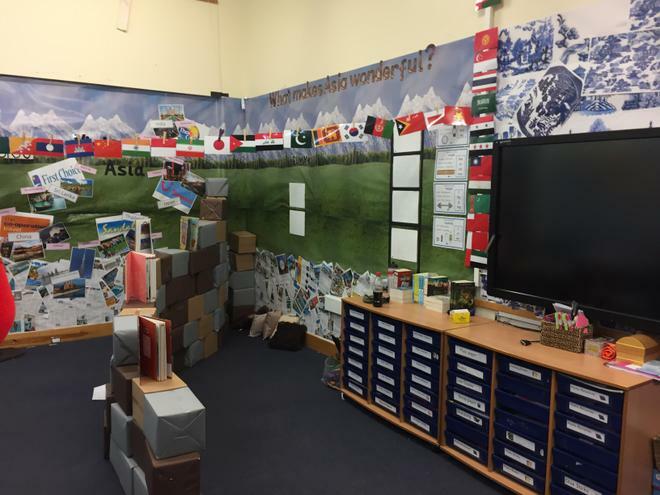 We will also be focusing on our geography skills and learning about cities, countries, continents and oceans from around the world. 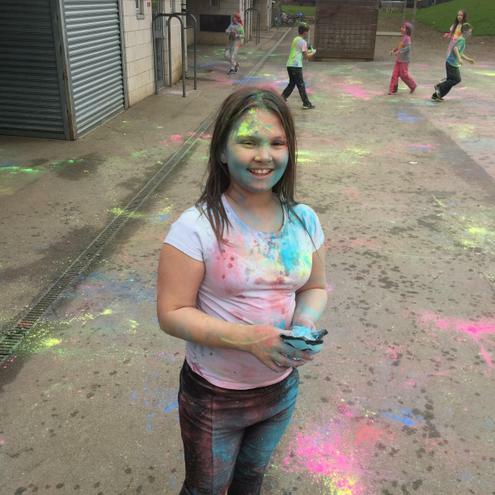 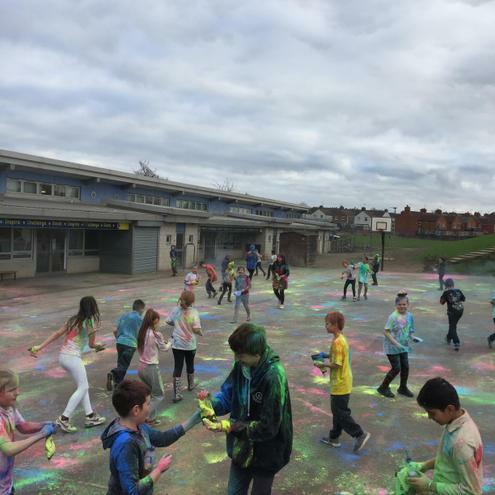 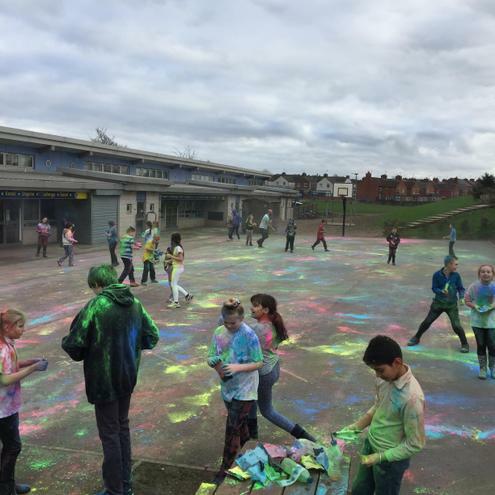 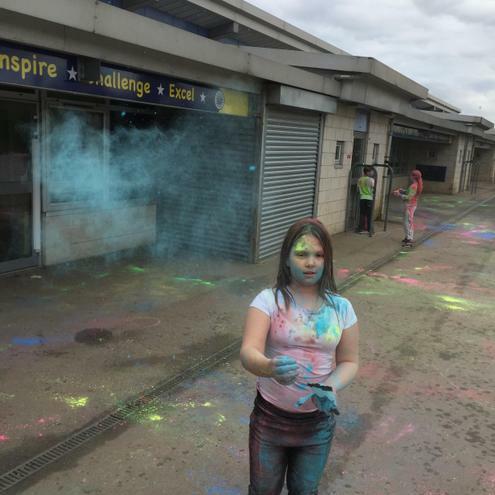 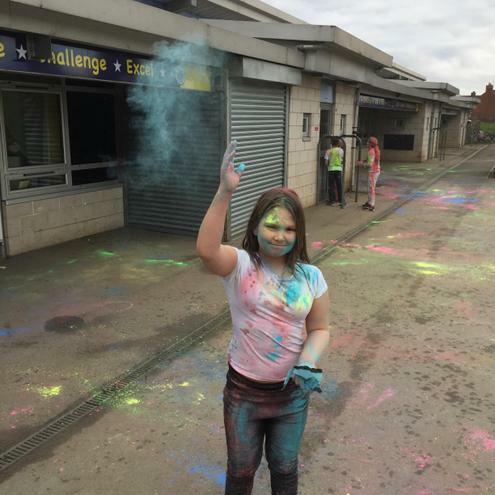 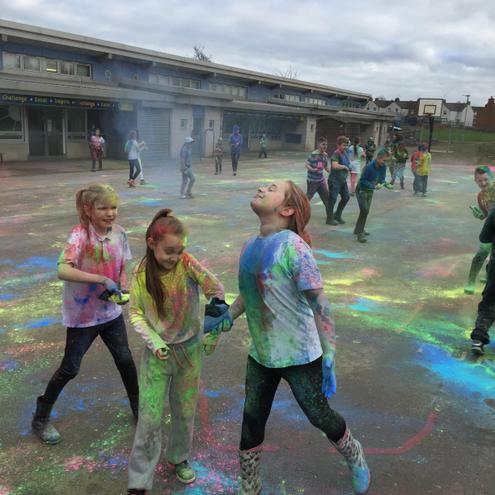 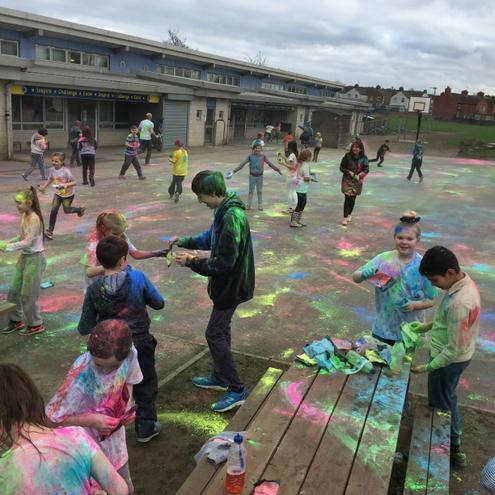 As part of our Asian Topic, as well as celebrations week, we celebrated the Hindu festival, Holi. 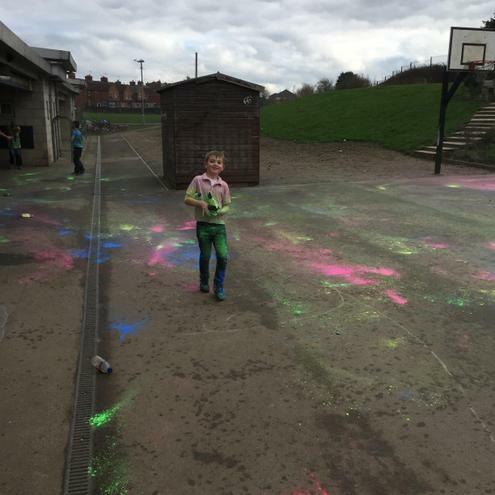 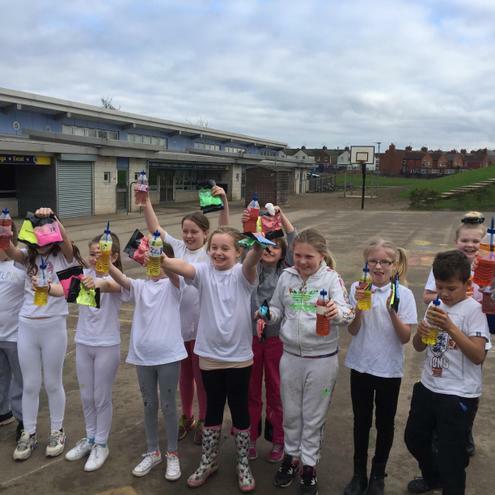 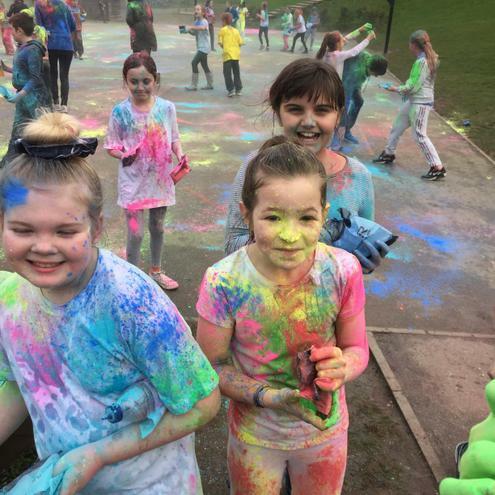 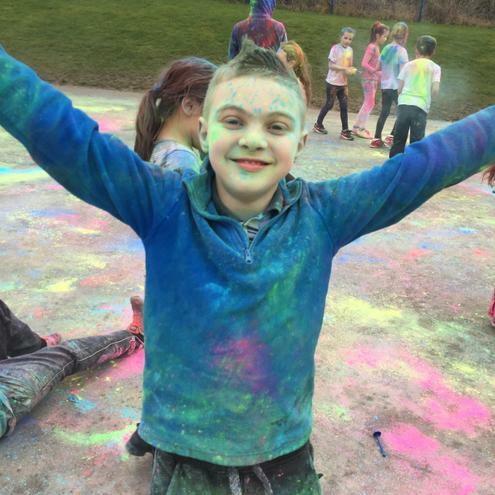 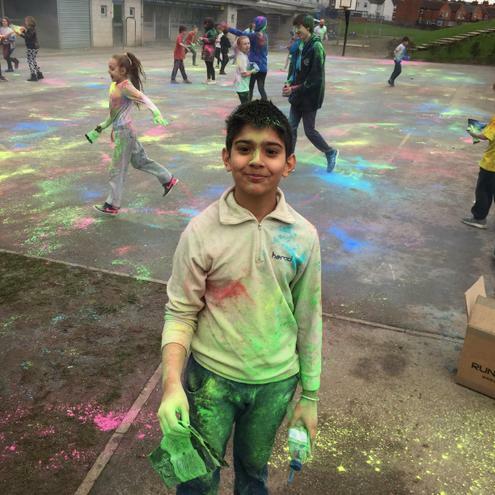 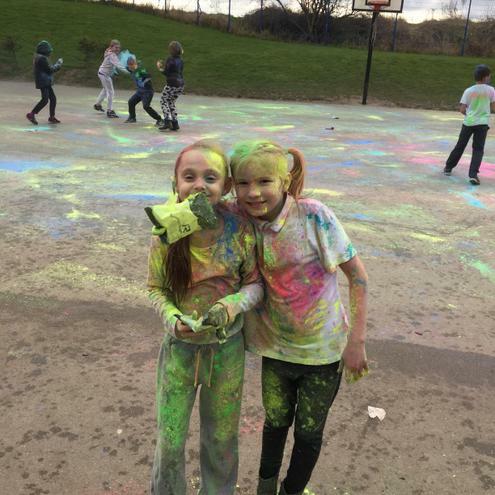 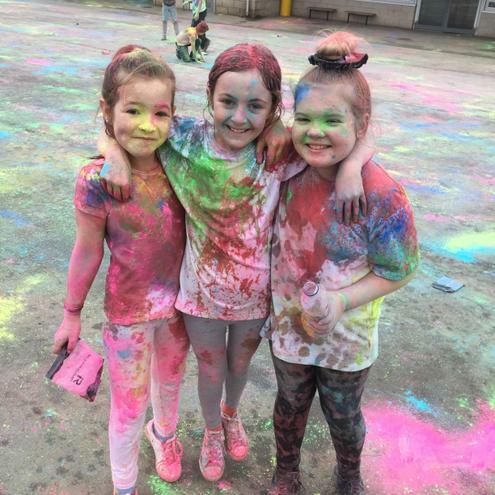 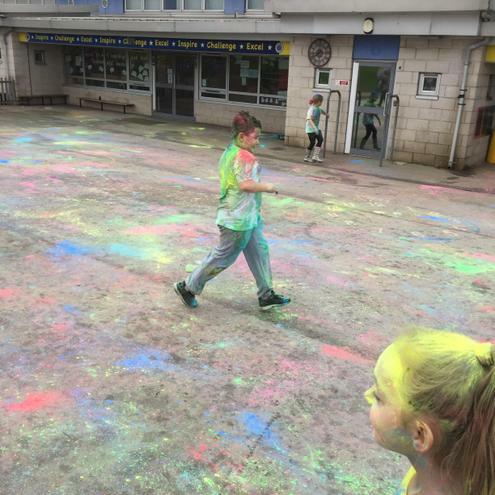 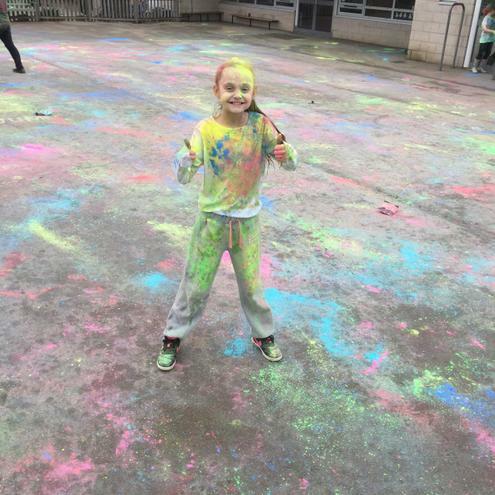 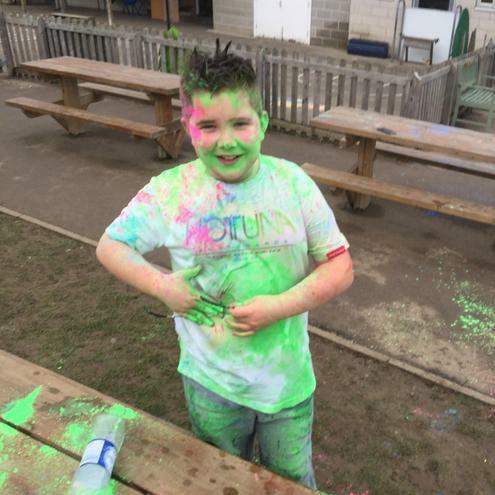 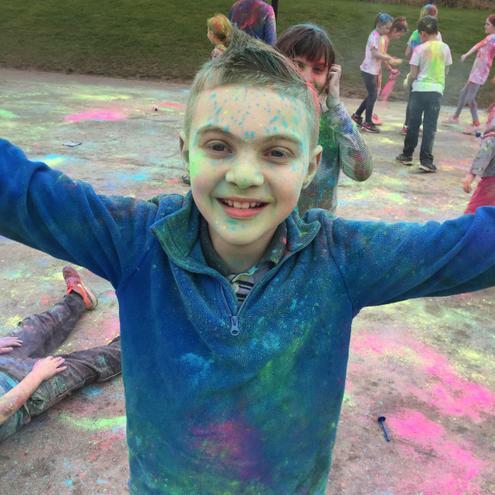 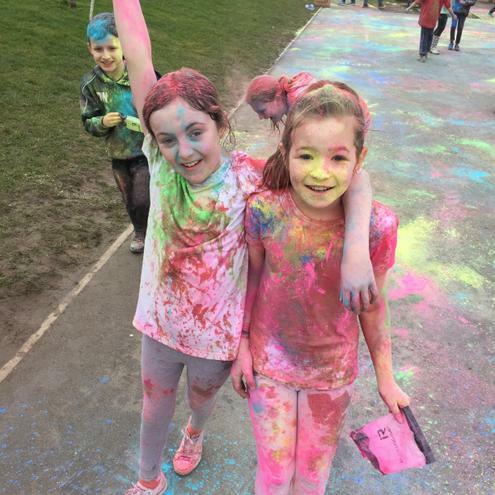 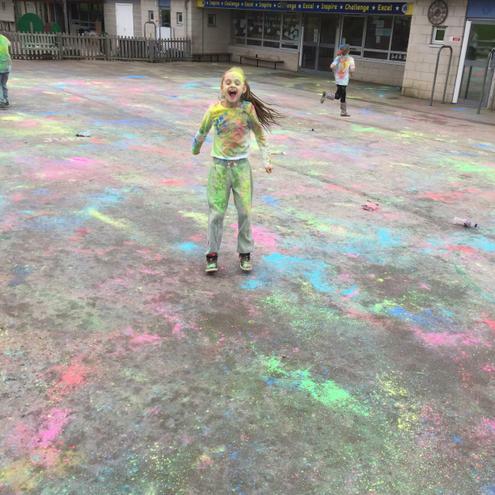 We have learnt some amazing things about the story of Holi and even managed our very own Holi festival in the school playground. 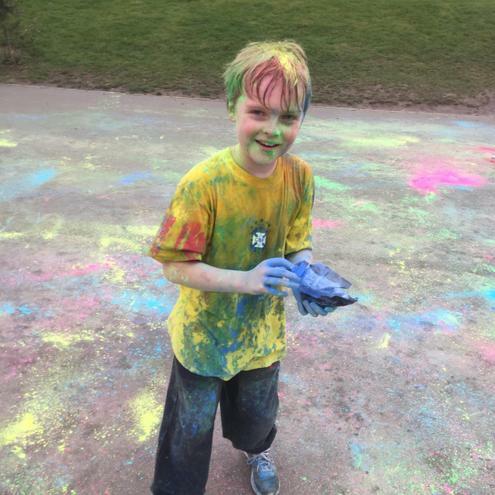 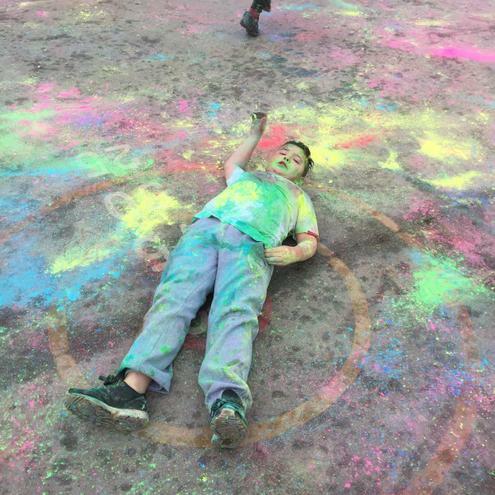 Take a look at the fun we had throwing paint and using our homemade pi!chkaris!! 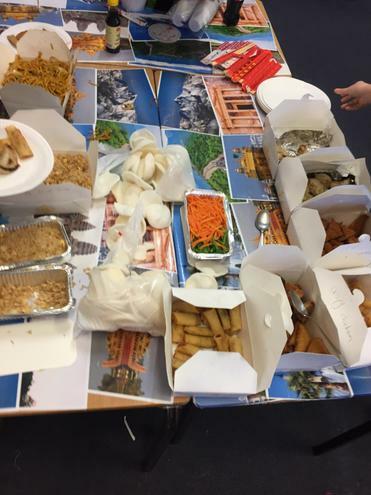 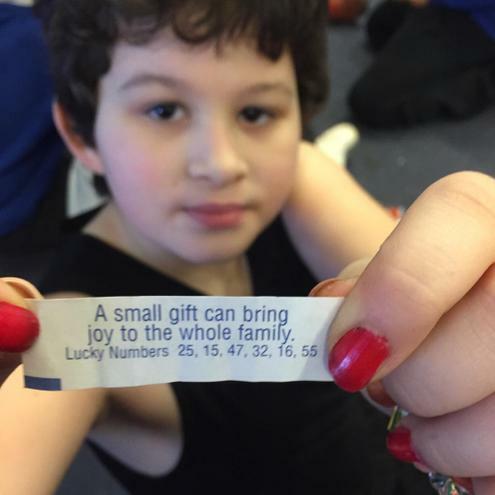 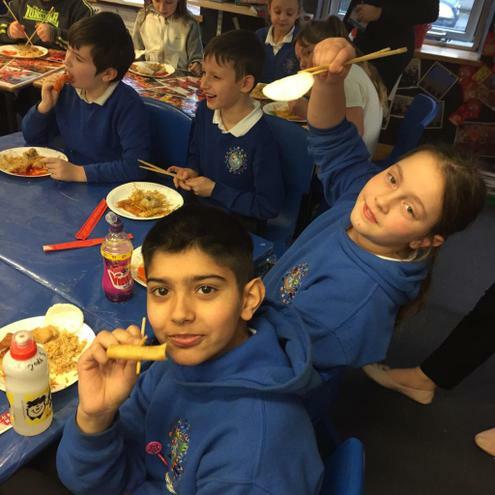 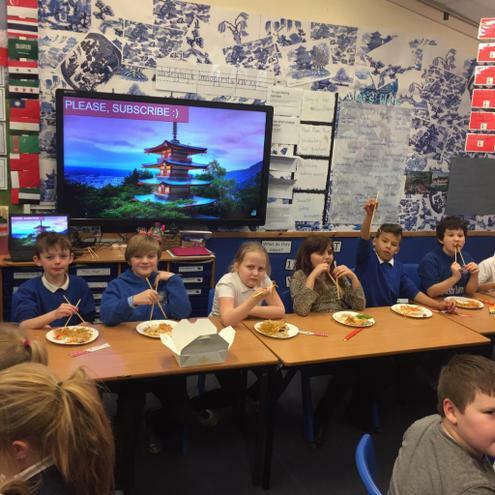 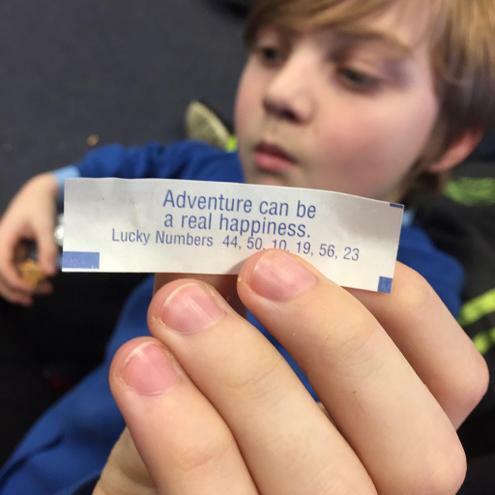 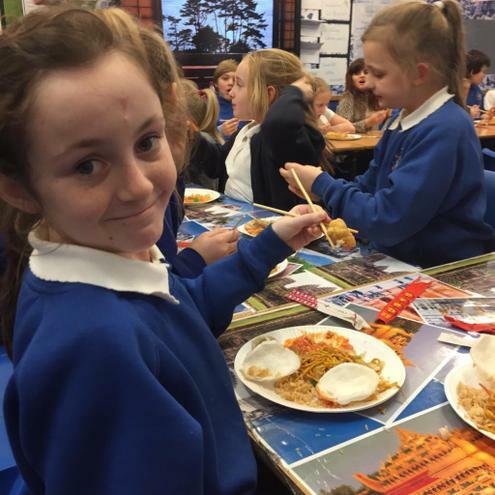 We also celebrated with our very own Chinese meal and we had the opportunity to taste some traditional Chinese foods. 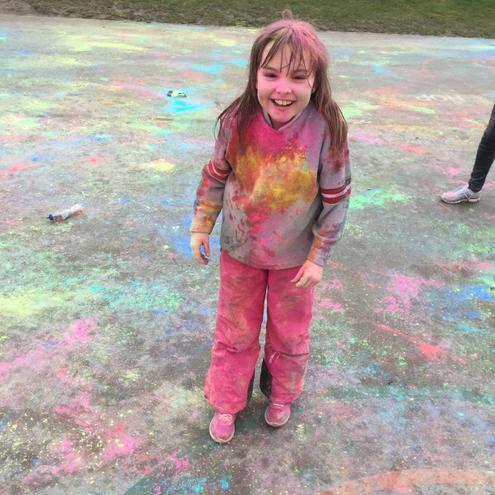 We had a great time and now have some new favourites! 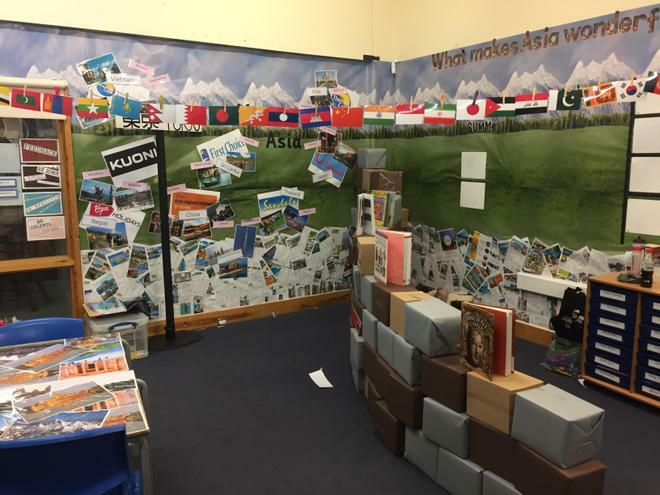 For our final product we are aiming to produce an audio book that persuades people to visit Asia to see some of the wonderful sights. 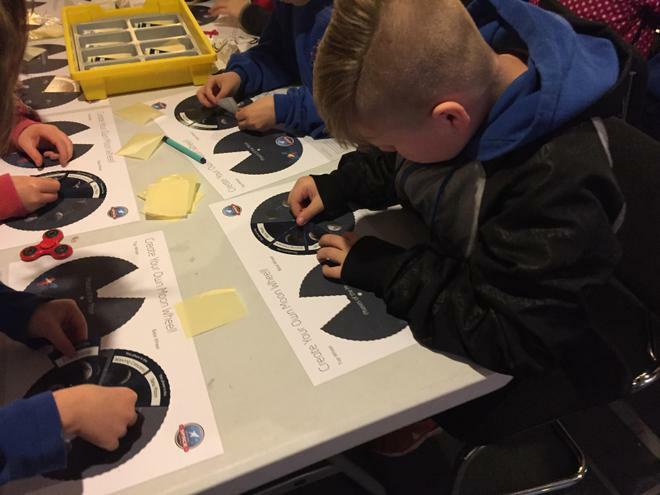 We will be working on many different projects along the way to help us develop all the skills we need to make our final product! 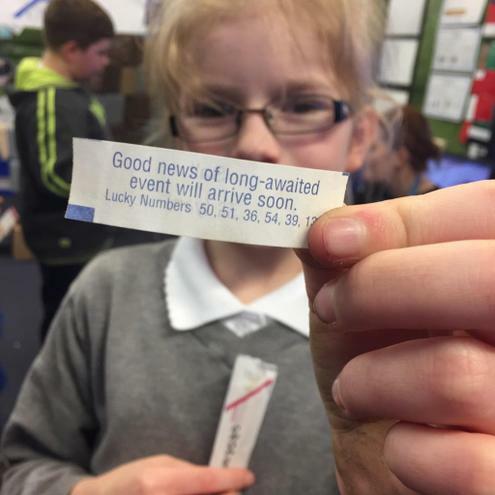 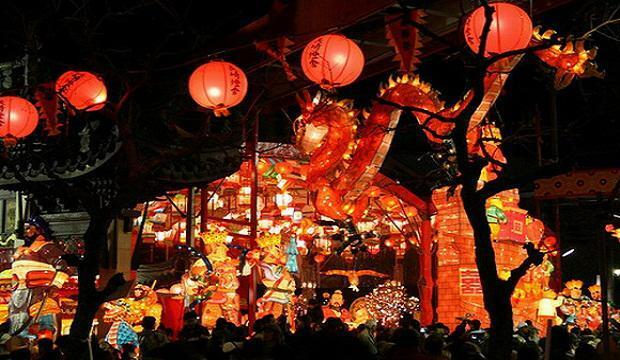 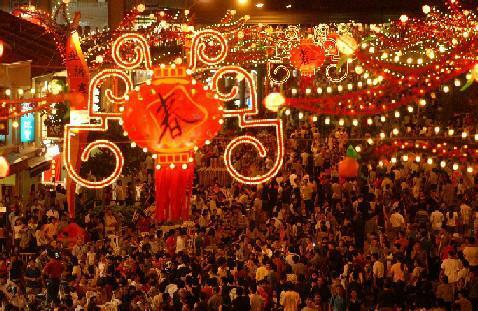 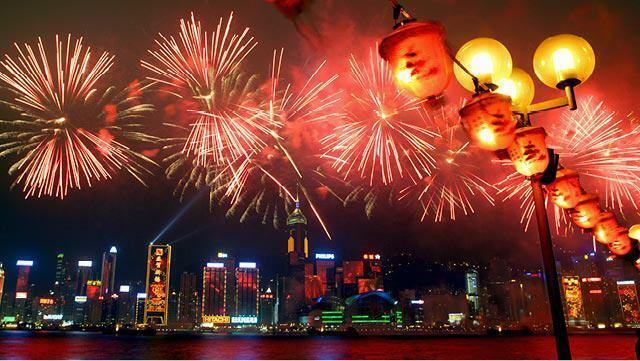 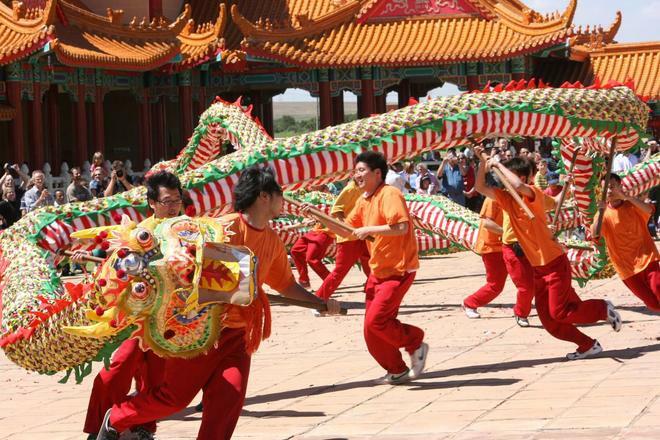 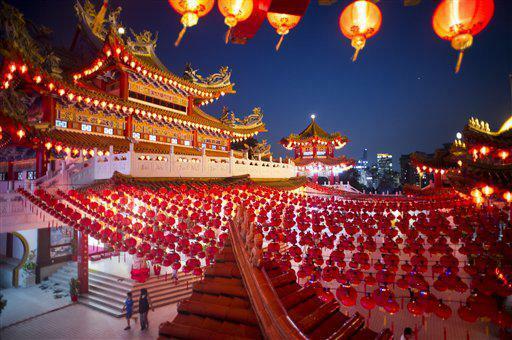 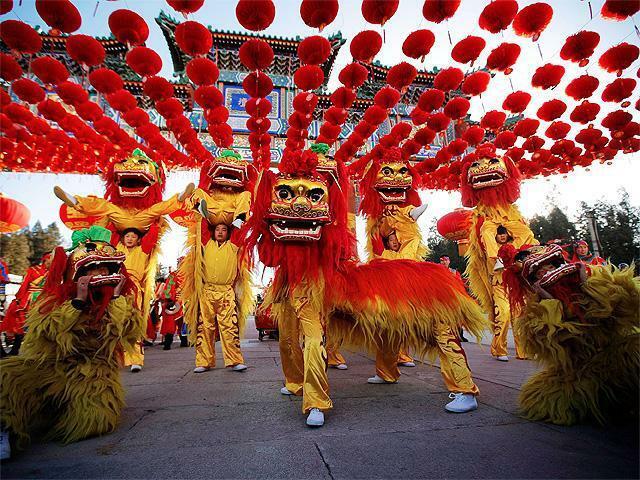 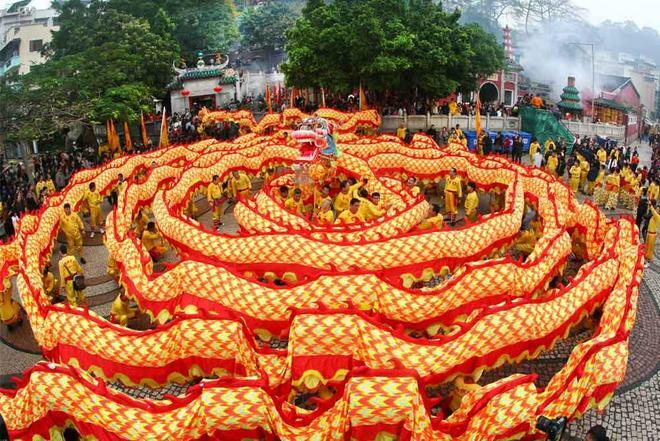 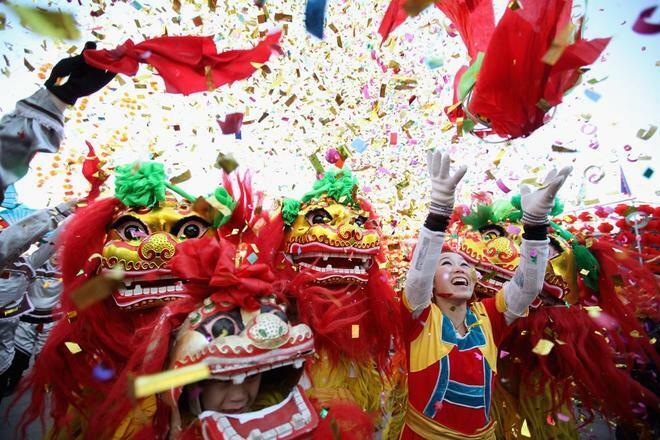 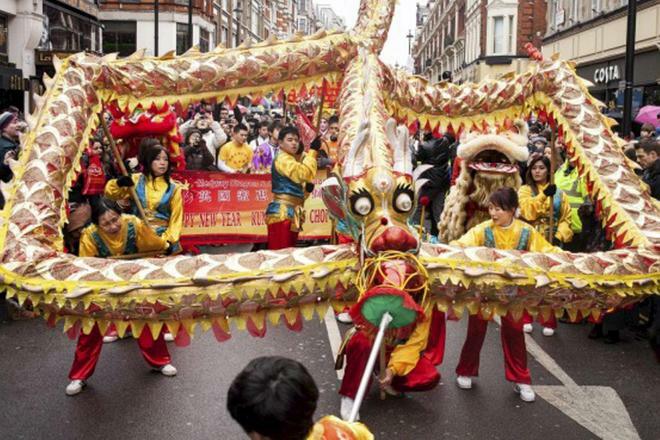 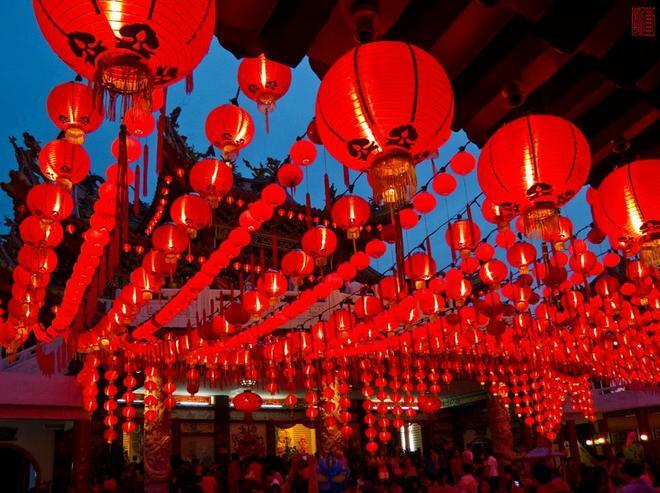 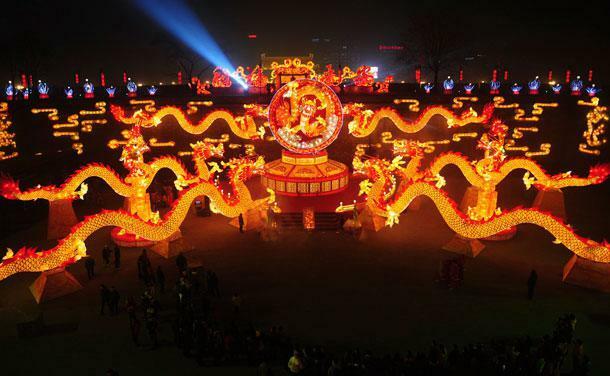 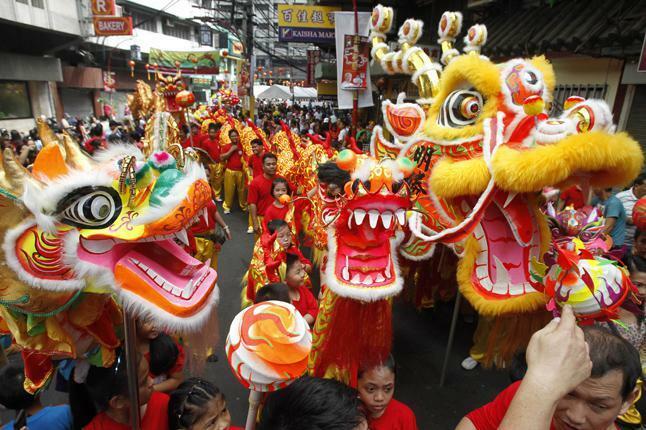 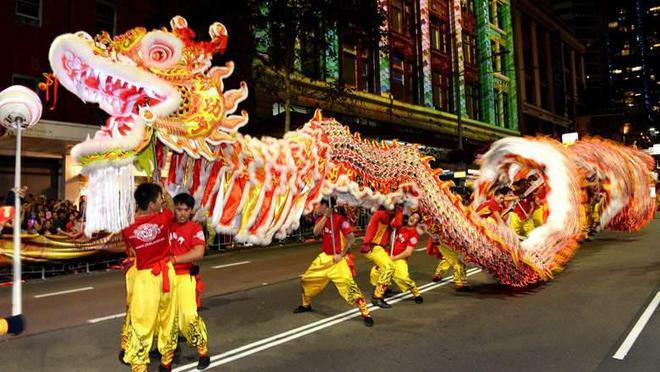 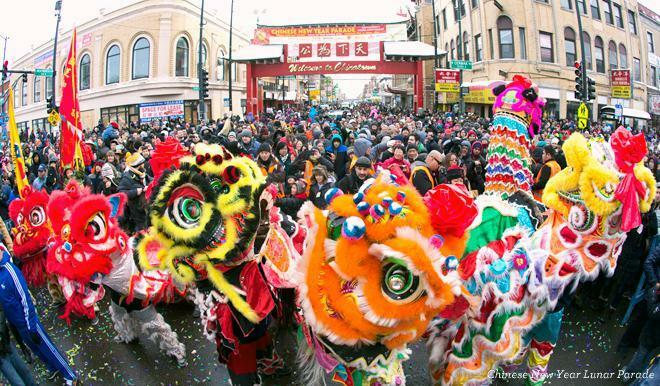 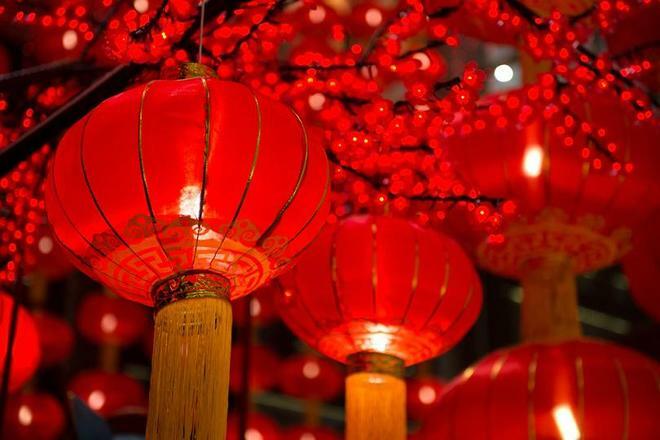 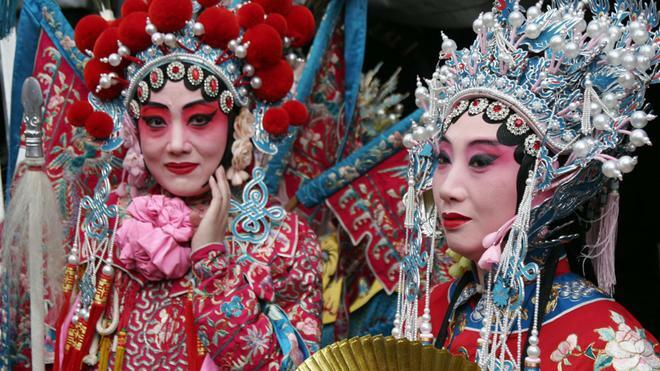 We will also be looking into the celebrations for the Chinese New Year and having a Chinese New Year party of our own! 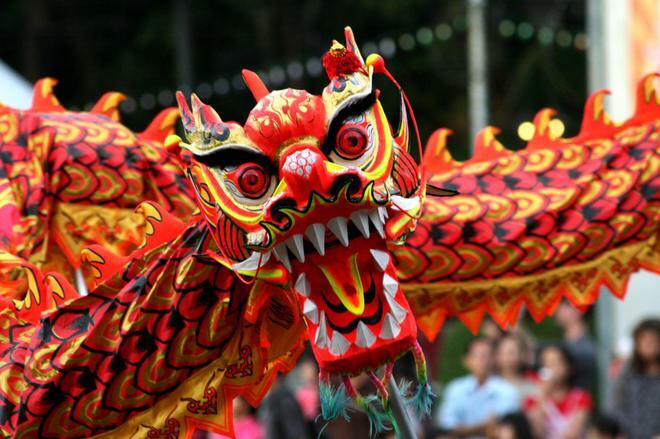 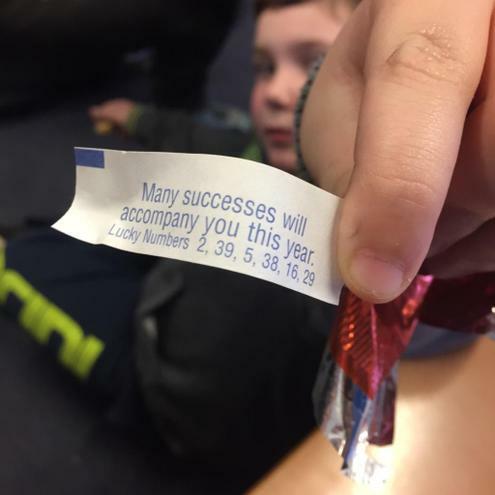 2017 - The Year of the Rooster! 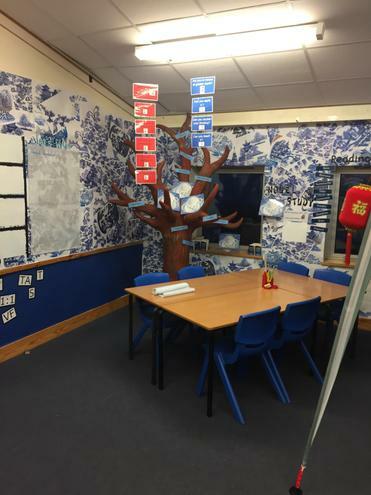 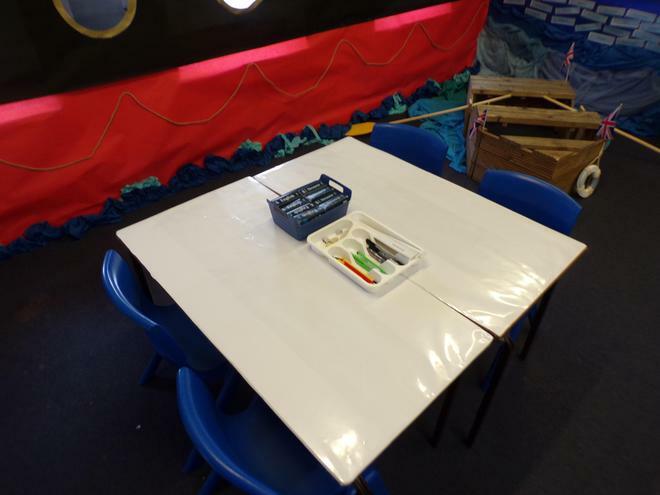 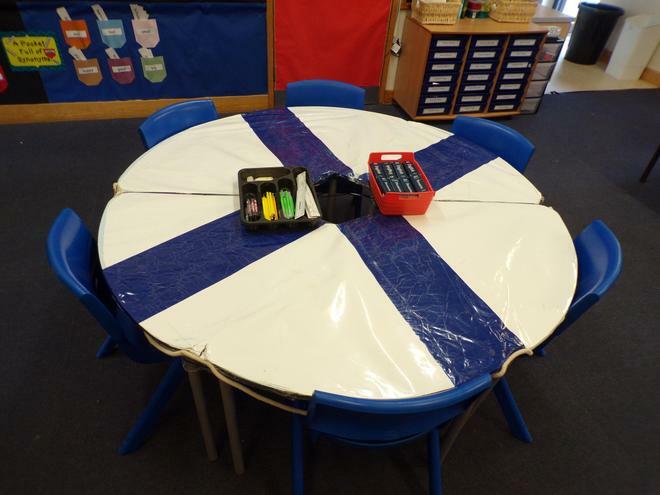 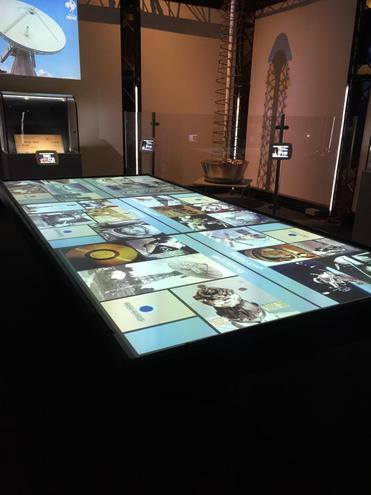 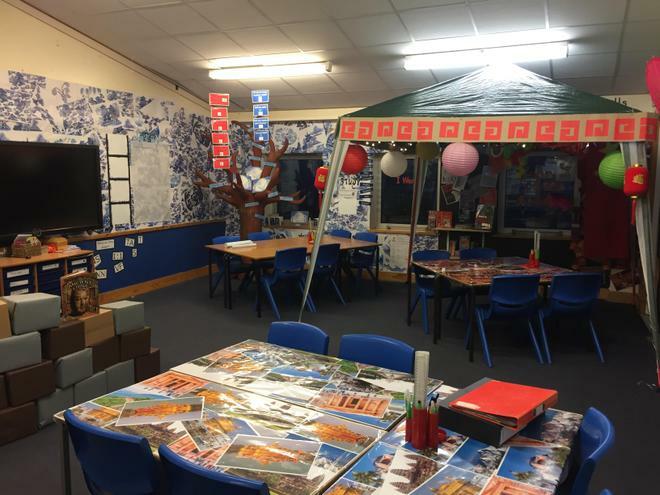 Have a look at our new classroom, inspired by the wonders of Asia. 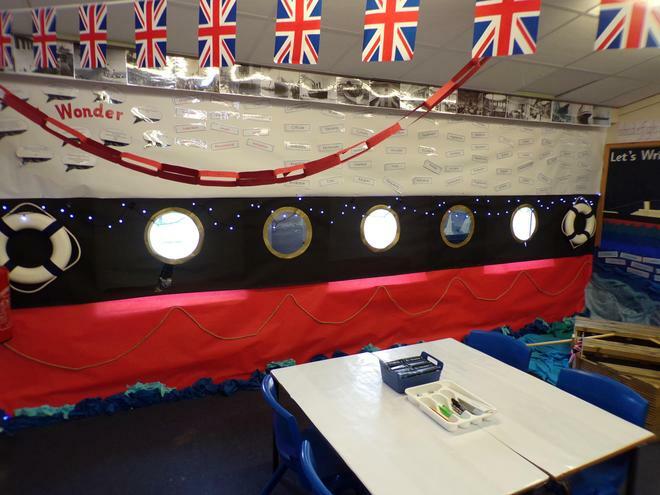 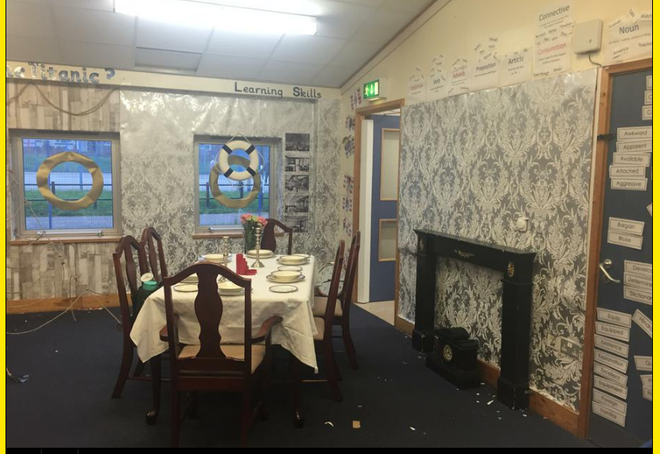 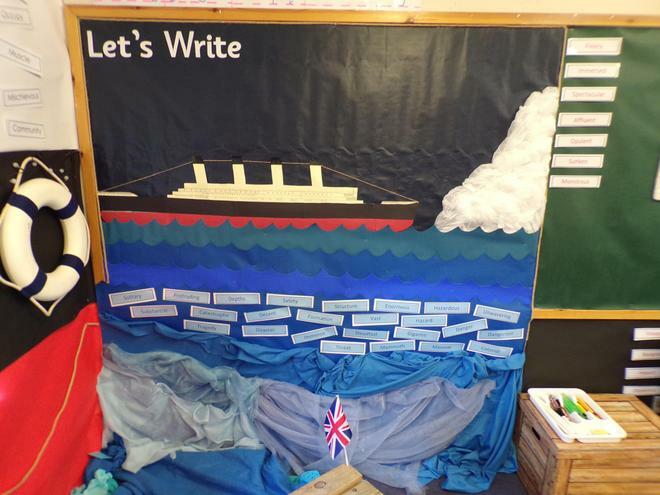 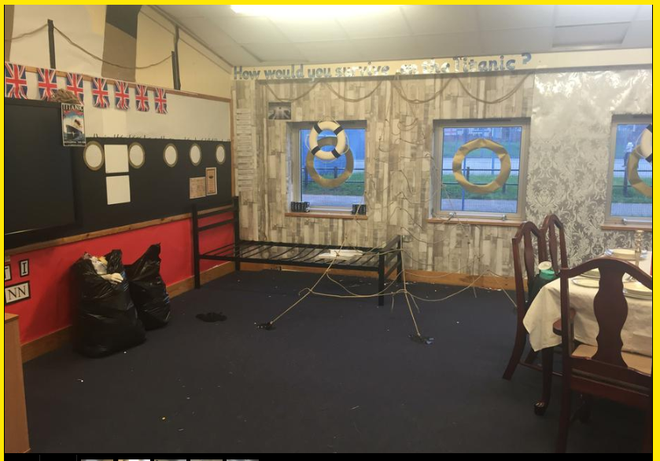 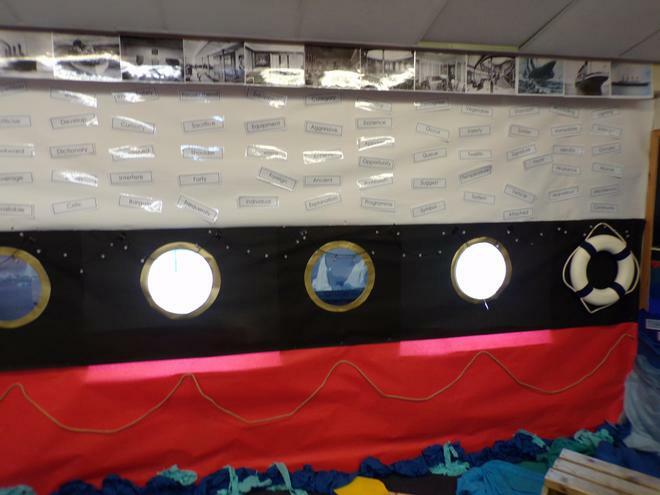 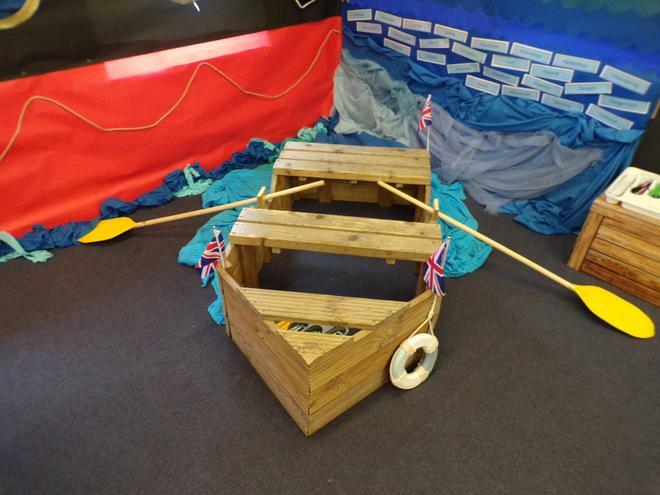 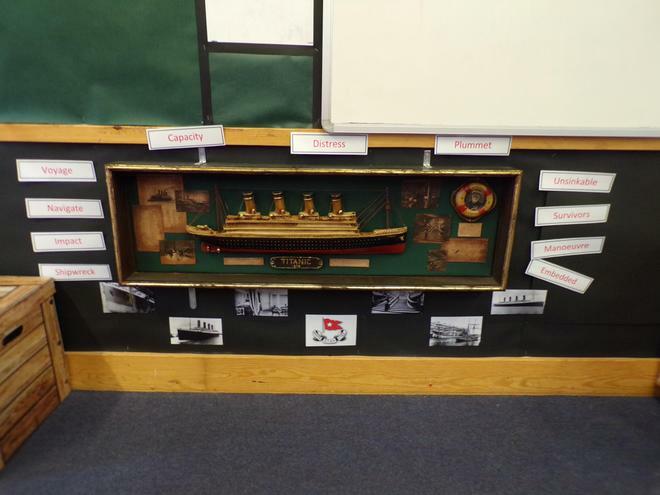 For our topic we will be learning all about life on board the Titanic and the many mysteries that surround the sunken vessel. 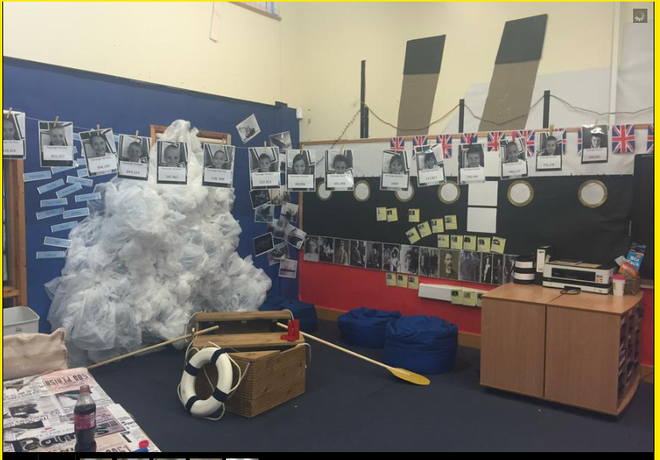 Our aim is to discover everything we can in order to create water safety presentations and make people more aware of water danger to help save lives! 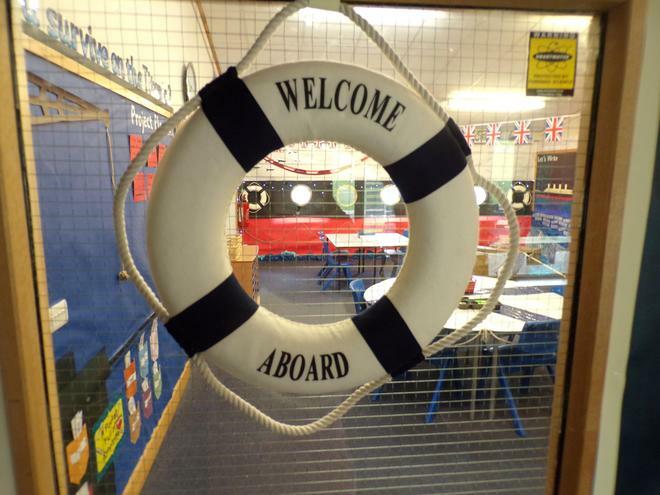 Keep visiting our page to find out how we are getting on! 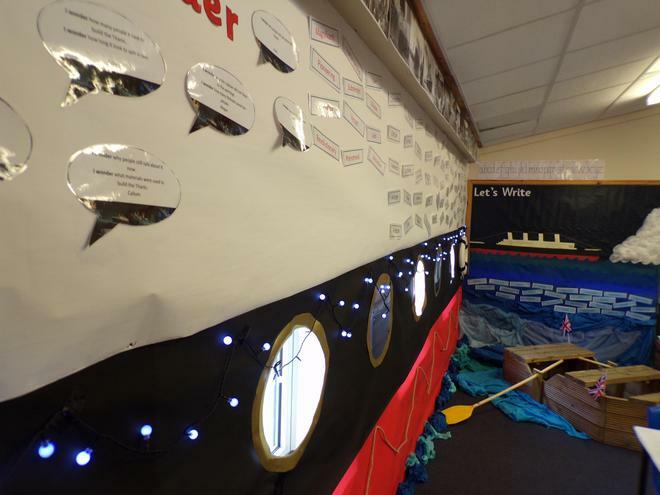 Our class reader for the Autumn Term is Titanic 2020 by Colin Bateman. 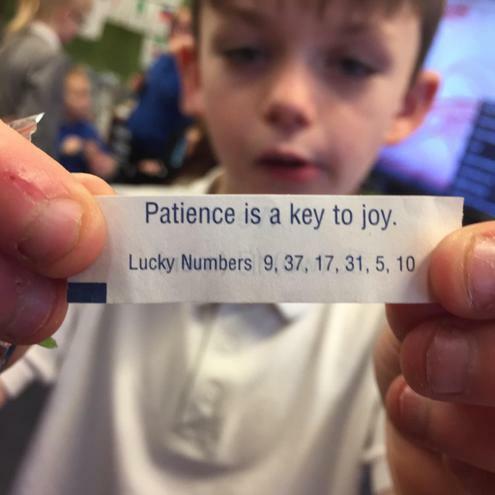 We will be reading this book at the end of every day. 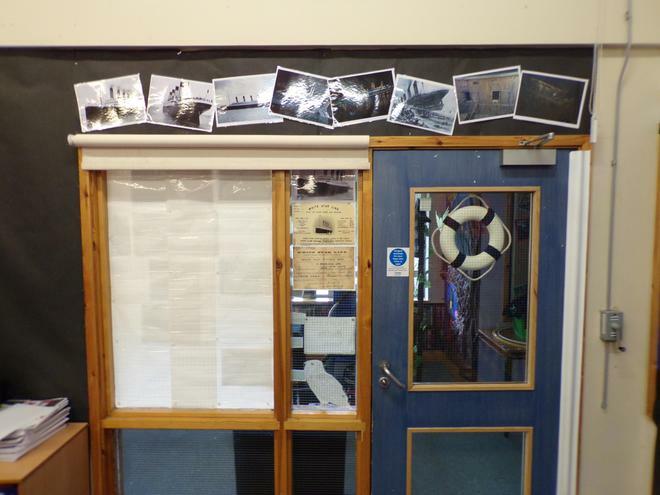 Our novel study for the Autumn Term is Kasper the Prince of Cats by Michael Morpurgo. 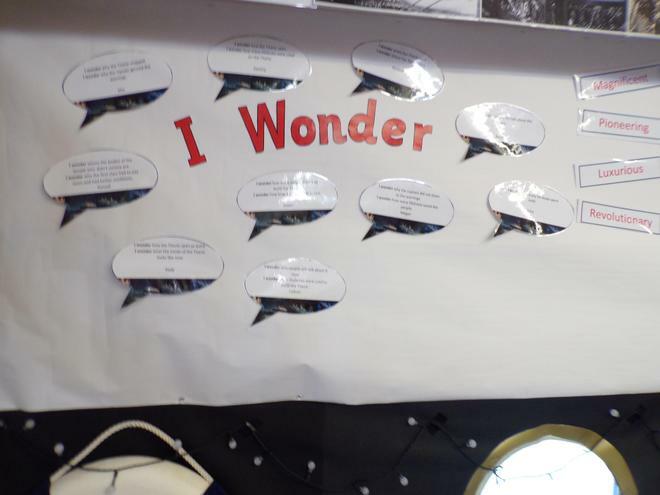 We will be looking closely at this book for some of our guided reading sessions. 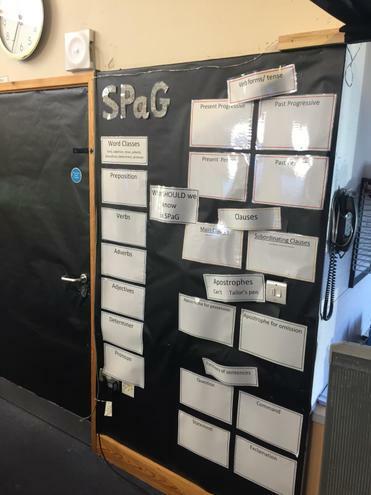 This is the list of spellings that all children are expected to spell by the end of year 5. 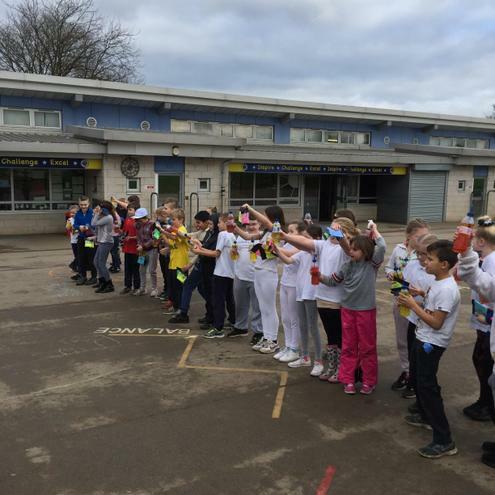 Let's get practising! 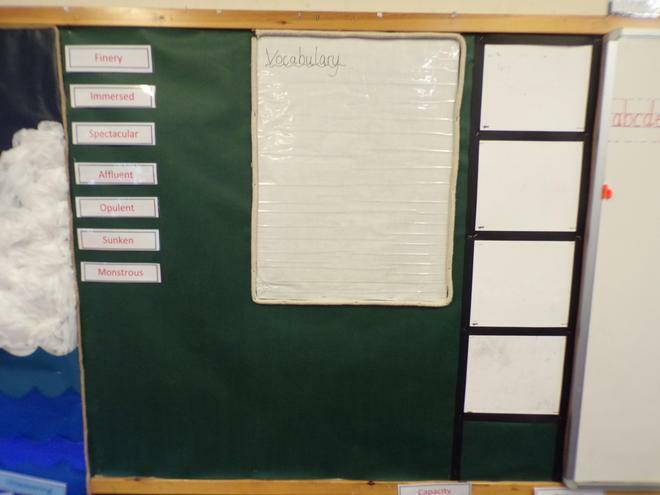 Spellings that your child should know by the end of the year are listed below. 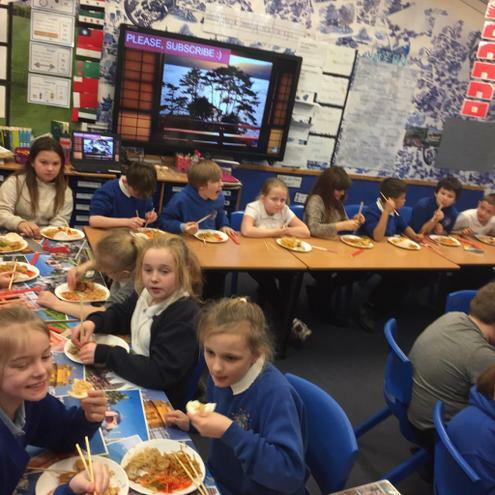 Please practise at home. 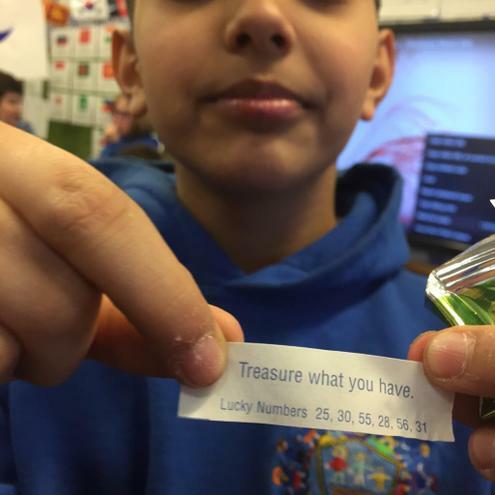 Major Dojo points will be awarded! 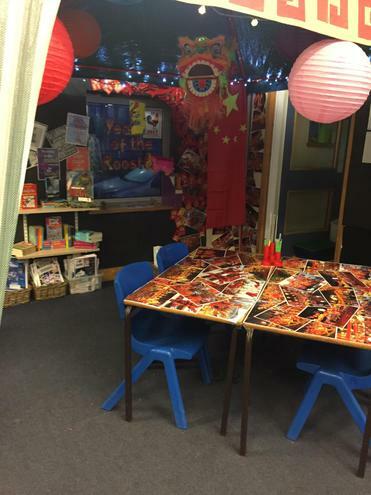 Here is a great selection of books that are recommended for children in year 5. 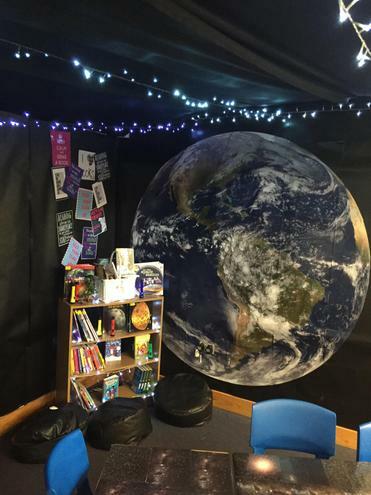 If you have a spare moment you could always pop down to the library and have a read! 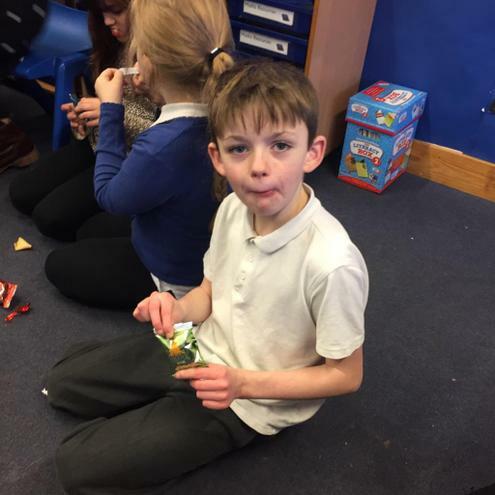 There are some super reads here!